Lite Source has a firm grip on the ins and outs of what makes crystal shine on interior lighting fixtures. On the Santuzza II, though, the full cut assorted crystal droplets take a back seat to the patterned lurex inset, which sits center stage. Warm light shines through the patterned inset with warmth, and light dances through the different textures and patterns of the detail. You choose the exact nature of the light, and change it whenever the mood shifts from dinner to discussion to the hour of warm embraces. Settings include halogen-only lighting, LED-only lighting, and an equal combination of the two. The lighting settings are controlled by a convenient remote control. For a dramatic entertainment setting, don’t forget to consider lighting when planning ambience. 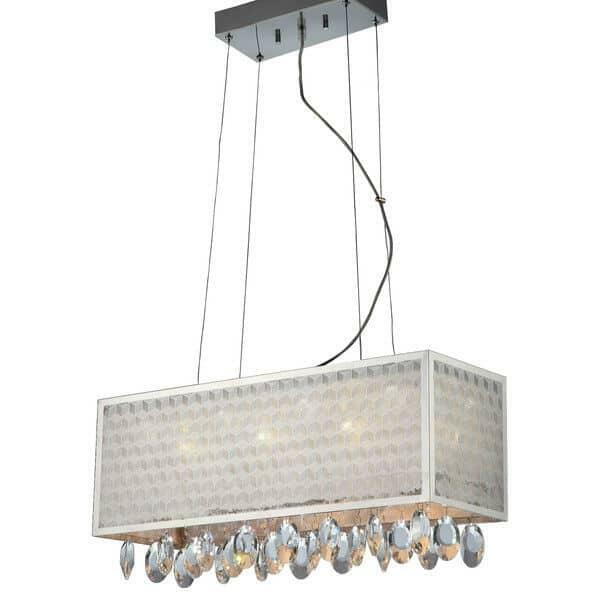 Turn to Lite Source for contemporary takes on the most classic lighting fixtures.